Traveloscopy Travelblog: Scotland’s Outer Hebrides: One beach of an airport. Scotland’s Outer Hebrides: One beach of an airport. Scotland’s Outer Hebrides: One beach of an airport. FOLKS who've taken themselves out to delightful Barra Island in Scotland's beautiful Outer Hebrides and want to do it again, find that when they start checking for the same arrival and departure times as they took last time, these appear to have been simply removed and replaced with others that can be up to hours different from before. And it's not because of bureaucratic reviewing or rearranging – or worse still, even bungling – but more bizarrely is the work of Mother Nature, and her daily changes in the times of the island's tides. 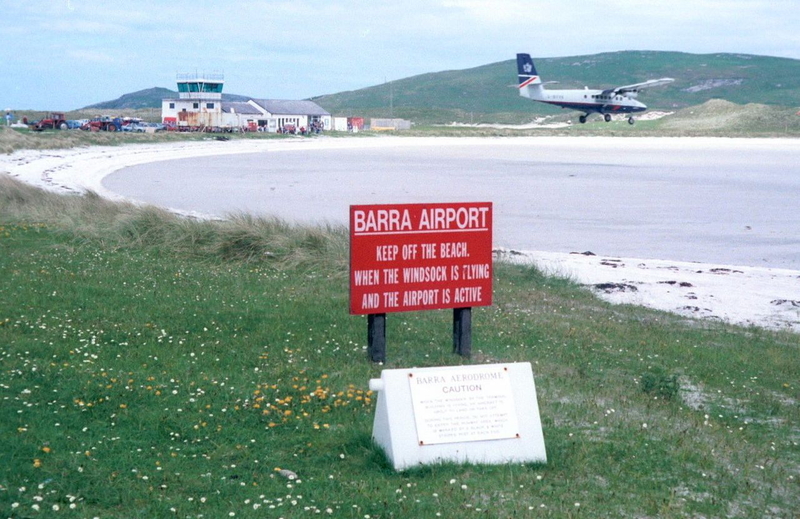 Because while Barra's airport terminal building and control tower are located on the island's "mainland," its three runways are in fact simply the sands of the fringing ocean beach alongside – making for the only airport in the world where scheduled 7-day-a-week flights use a beach as the runway. And because they are flooded by the sea every high tide, these runways can only be used by STOL aircraft (Short Take Off and Landing,) and only during daytime low tides, as there are no facilities for night-time operations other than emergencies. As well, as tide times change daily, it means flight times change pretty regularly too, so beachgoers need be prepared to make a move with the Esky and towel when the warning signals go off advising that a plane's about to land or take off.